Create fast, low-cost connections via text to anyone around the world in a secure and reliable App. Global SMS & IM to reach everyone. Text other World Message users for free! 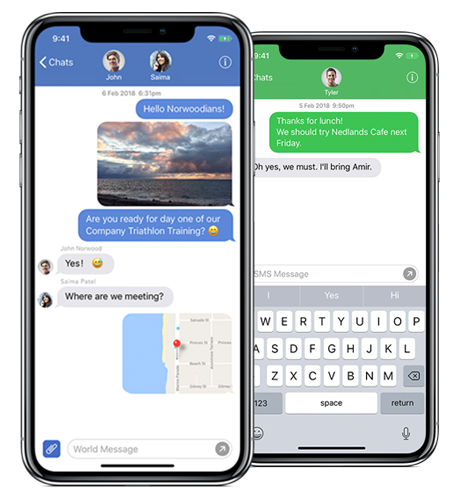 Experience a familiar and easy-to-use interface with all the features you expect from a modern messaging App and more! Leverage our ‘Shared Economy’ enabled, low-cost SMS to any international destination. Don’t let international fees stop you anymore with World Message’s low rates. Effortlessly rent a local or international number in-app, for travelling and to message with your distant contacts and relatives. Numbers are available in more than 70 countries! Enjoy chatting with rich media. Send locations, images, and contacts. Quickly message important contacts and threads with Dynamic SMS™. When paired with the powerful Corona® Cloud platform for enterprise, World Message can do some amazing things! Enterprises can provision a business-owned phone number, archive all communications for regulation compliance, and enjoy incredible convenience and savings. We want your experience on World Message and Corona® to be memorable. If you have any questions, have a look at the FAQ here for help.